My tiny hometown with a population of barely 500 inhabitants is rich in history. Among our claims to fame is the fact that Harrisonburg, Louisiana is the second oldest town in Louisiana. Many believe it is the oldest, though there is no paperwork to prove it and so the little village must settle for secondary honors. Additionally, in the mid-1800’s Harrisonburg nearly became the state capitol, losing by a narrow margin to Baton Rouge. At that time, it was a bustling trade center with several thousand residents. It was located right along the Ouachita River with easy access to the Mississippi River and the large port in New Orleans. Roads passing through Harrisonburg connected with the Natchez Trace in Mississippi and the El Camino Real in Texas, making it relatively easy to travel throughout the area by wagon as well. But in later years, the railroad would miss Harrisonburg altogether, and as a result the town would begin to slowly decline. And last, but not least, it was site of a battle during the Civil War. There in the hills surrounding Harrisonburg was Ft. Beauregard, a stronghold for the Confederate soldiers. In 1863, four Union gunboats came by on the Ouachita River. 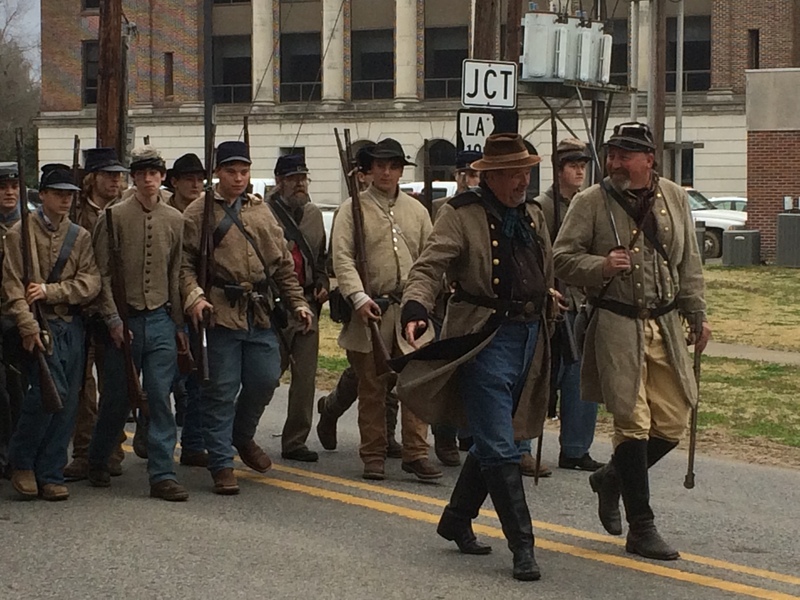 From their position high on the bluffs, the Confederate soldiers spent four long days successfully protecting the inhabitants of Harrisonburg from the Union attack. The Union gunboats eventually left, leaving nothing behind except a hole made by a cannonball in the Methodist Church. 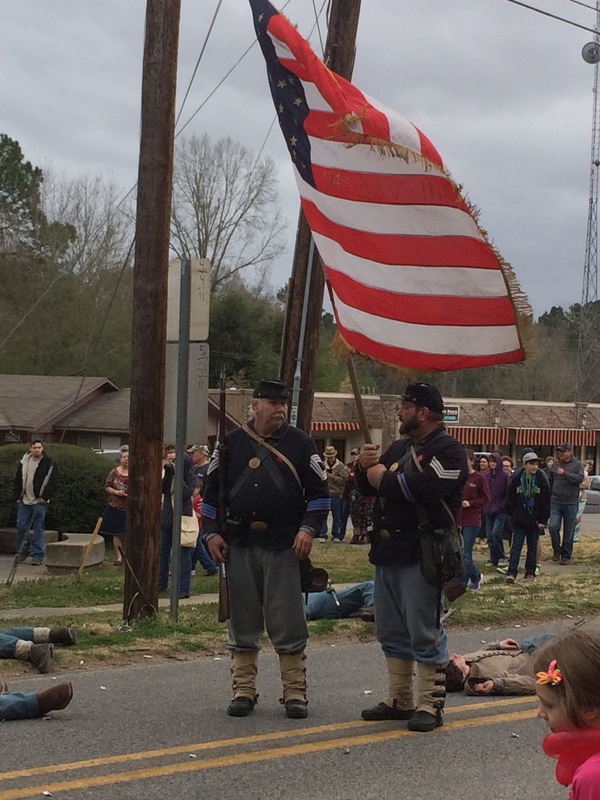 When I was growing up, one of the highlights of each fall was the Re-Enactment of the Battle of Ft. Beauregard. 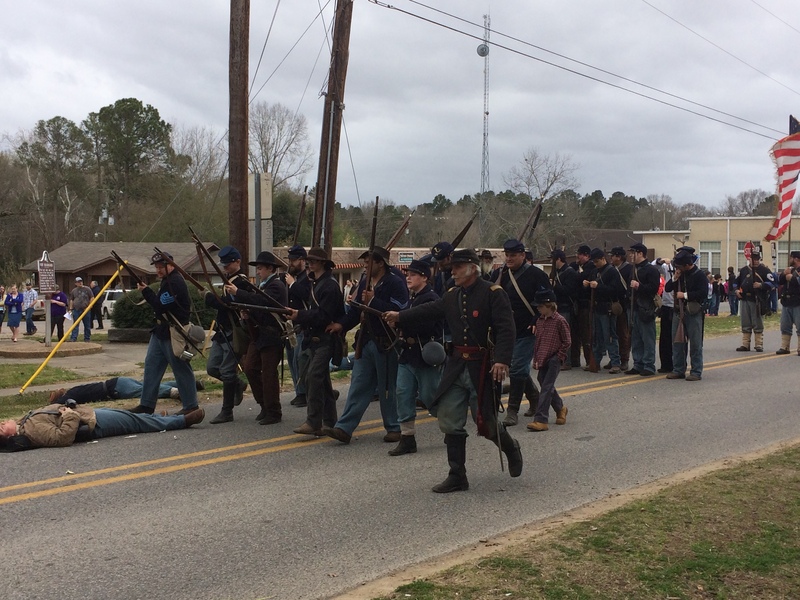 We would delight to see men dressed as Confederates and Yankees fighting in the streets and then up in the hills around the town, sounds of rifles and cannons reverberating in our ears. 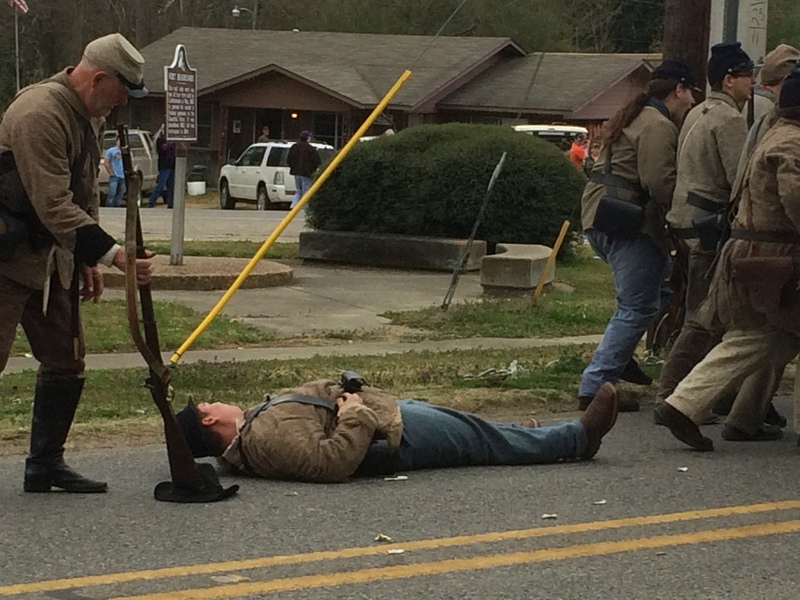 One year a Confederate soldier fell during the battle. Apparently he was an actor at heart, for he writhed around on the ground, clutching at the wound. First he rolled to his left, and ended up in a pile of fresh dog poo. Seeing where he was lying, the dying soldier continued his act and rolled over to his right, where he soon discovered lived a large number of ants. The poor soldier soon decided he was not dying after all, and had enough strength to removed himself from that area altogether. With many of the re-enactors, it was popular to carry fake blood to make the wounds seems more realistic. 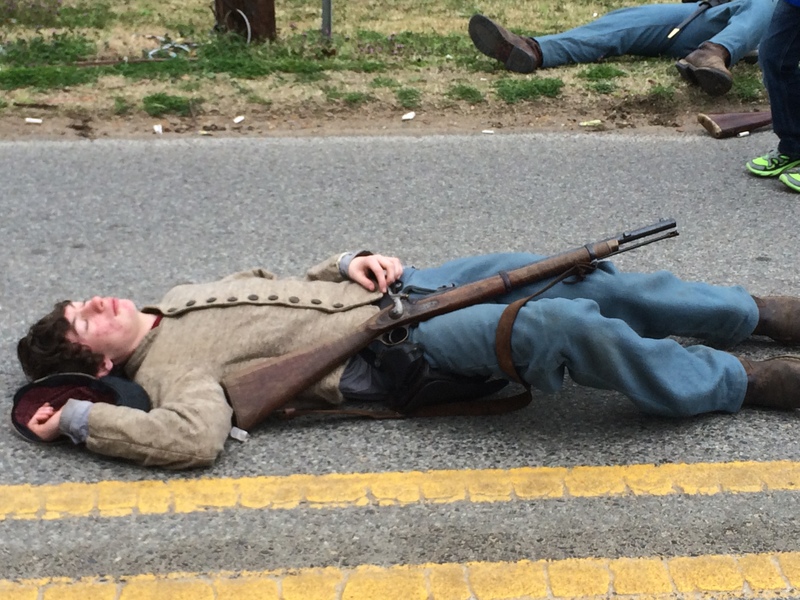 So one year we were stunned to find out that the Yankee soldier who we thought was doing such a great job of acting wounded truly was injured when his rifle backfired. It wasn’t fake blood after all! 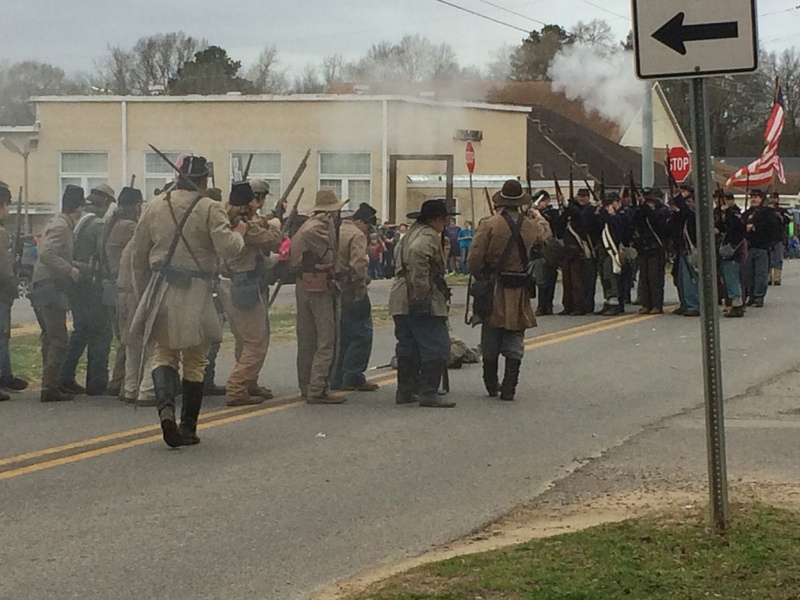 But nearly 20 years ago, the town stopped holding the re-enactment. You can’t imagine my delight when my mother announced that there would be another re-enactment. 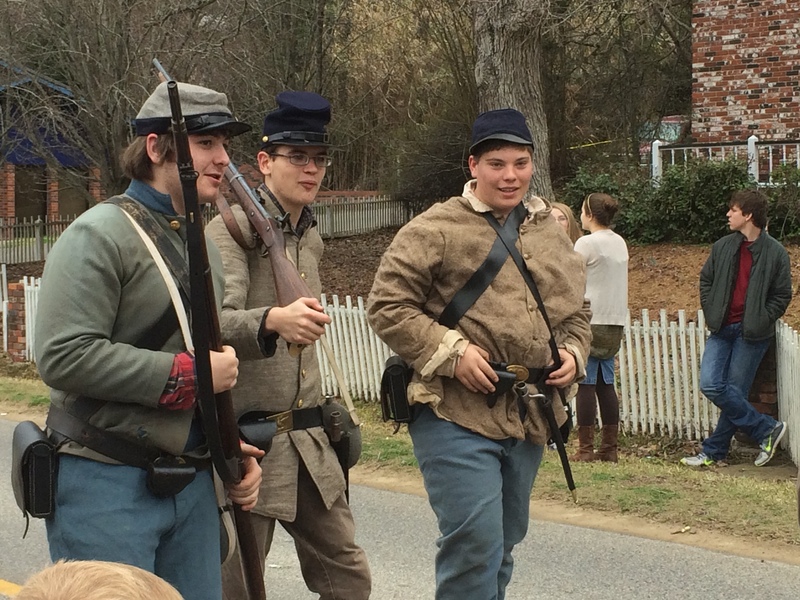 Immediately, I made plans to take my five children so that they might have an opportunity to experience something from my childhood as well as enjoy a living re-enactment of Harrisonburg history. I’m glad I did … as it was definitely a weekend of fond memories and a weekend of making new memories, too. 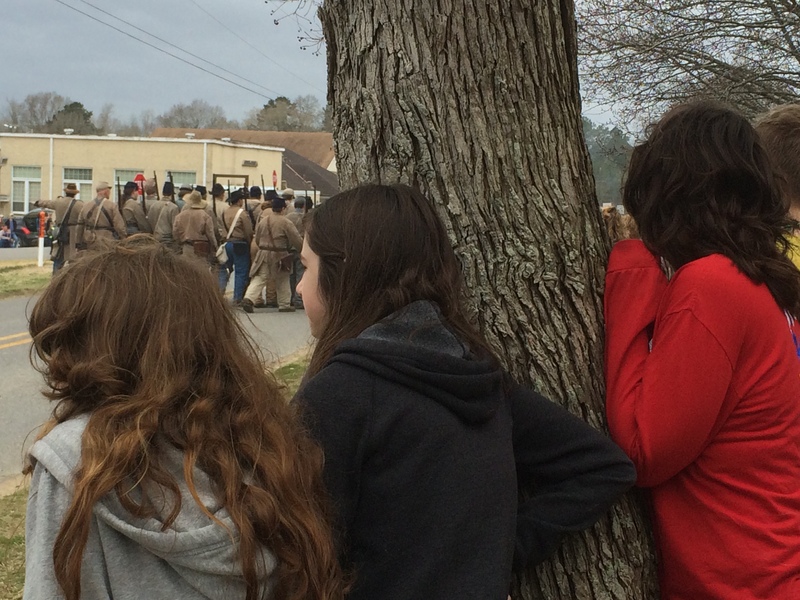 Some of my kids watching the battle unfold along the streets of Harrisonburg. Please … stay tuned for a retelling of a Civil War lore from my own family history, one that I was reminded of as I shared stories and history with my children over the weekend. It’s one that always draws a laugh!